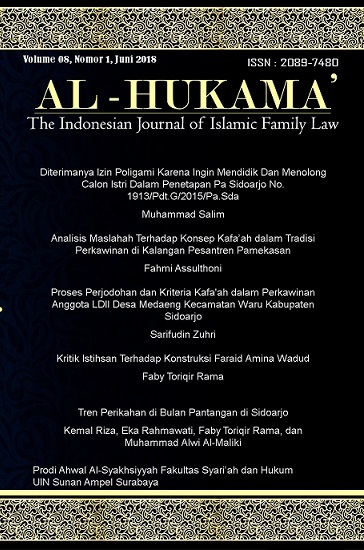 This Supreme Court regulation was formed because there is still widespread discrimination and gender stereotypes in the courts in Indonesia. This regulation is a maslahah hajiyah because this benefit is needed by humans, especially women who are faced the law for the convenience of their lives. If this regulation is not implemented, it will cause difficulties and negative impacts on women, both psychologically and physically. However, these difficulties do not damage the order of human life. The issuance of the Supreme Court regulation, it is expected that gender stereotypes will no longer occur in examinations in courts that can have a negative impact on women dealing with the law, both psychologically and physically, and the issuance of decisions that are gender biased. Supreme Court Rule Number 3 of 2017 concerning Guidelines for Judging the Case of Women Facing the Law, hoped that it can become a standard for judges and all judicial apparatus, in the process of examination in the courts in handling cases involving women, both as perpetrators, victims, witnesses and parties, so that the goal of eliminating all potential discrimination against women facing the law can be achieved.